Houston has a strong and growing arts scene. There are world-class museums, including the Museum of Fine Arts of Houston, the Houston Museum of Natural Science, and the Menil Collection. It has a theatre district with the second-highest number of seats in the United States — home of the Alley Theatre, the Wortham Center, Jones Hall, the Hobby Center for the Performing Arts and the Houston Ballet. Artists and performers from around the globe come to Houston to create, study, and exhibit their work. Additionally, Houston has major league football, basketball, baseball and soccer teams, as well as facilities such as those at the University of Houston where athletes from all over the world come to train, including swimmers and gymnasts. Performers, artists and athletes fall under special categories for visas. Not many attorneys have experience with this area of immigration law. Kathryn Karam has experience handling complicated cases, and applying creative solutions to difficult immigration issues. Call Karam Immigration law at (832) 582-0620 today if you are a performer, artist or athlete seeking immigration assistance, whether currently in Houston or if seeking to come to Houston. There are many reasons that an artist, performer, or athlete might be in Houston for a short period of time. If you are an artist or performer, you may have an exhibition or show in town. You may be studying here, or may be performing for a season or for the length of a play. If you are an athlete, you may be training here for a period of time. You may have signed on to play for a team, but plan on returning once finished. In such cases, you need a nonimmigrant visa. Performers, artists and athletes fall under special categories for visa: O and P.
O-1 visas are for athletes (who should seek an O-1A visa), artists, performers and movie and television directors (who should seek an O-1B) with extraordinary ability. Athletes must be among the most elite, those who fall within a small percentage of performance at the top of their field. Artists and performers must have achieved substantial distinction. Movie and TV directors must have demonstrated achievement. A person who serves as an integral part of an athlete's work, or an essential part of an artist's or performer's may seek an O-2 visa. The spouses and children of O-1 and O-2 visa holders may seek an O-3. P-1A: These are for internationally recognized athletes coming to compete, either individually or as part of a team. P-1B: This visa is for artists who perform as a part of an internationally recognized entertainment group. P-2: Artists and performers who qualify for P-2 visas are part of a reciprocal cultural exchange program. P-3: These are for artists and entertainers who are part of a culturally unique program seeking to perform, teach or coach in the Houston area. Alternatively, you could seek to make Houston your home. To move permanently to Houston, you will need a green card, also called permanent residence. Athletes, artists and performers may qualify for certain preference groups that could mean they receive permanent resident status faster than others. The first preference group, called EB-1A or EB-11, is for artists, athletes and performers who have demonstrated extraordinary ability. To fall under EB-11, a person must have either won a major international prize, like an Oscar, Pulitzer, or Olympic Gold Medal, or alternatively, he must meet three of 10 criteria, such as having their work displayed, being asked to judge others' work, or receiving lesser-known national awards. Artists and performers may also fall under the second-highest preference group, EB-2, by showing they fall under what is called Schedule A, Group II workers under 20 CFR § 656.5. These are people who have shown "exceptional ability" in the arts and sciences. 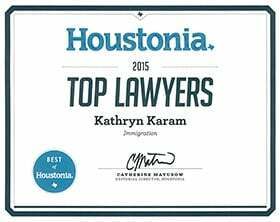 Kathryn Karam is a Houston immigration lawyer with unique experience in assisting performers, artists and athletes who seek to come to the Gulf Coast region from around the world. She understands the issues they face and knows the laws and regulations pertaining to their specific needs. If you are an athlete or are involved in the arts and are seeking the assistance of a knowledgeable immigration attorney, call today at (832) 582-0620 to set up a consultation with Karam Immigration law.